“I was the person who, when I wasn't performing in a show in a given evening, I was in Vancouver watching a show." - Kaylee Harwood. Samantha Gaetz. A lot has happened to Langley-born Kaylee Harwood since she got one of her first big breaks on Vancouver’s Stanley Theatre stage, in a 2009 production of Les Miserables. 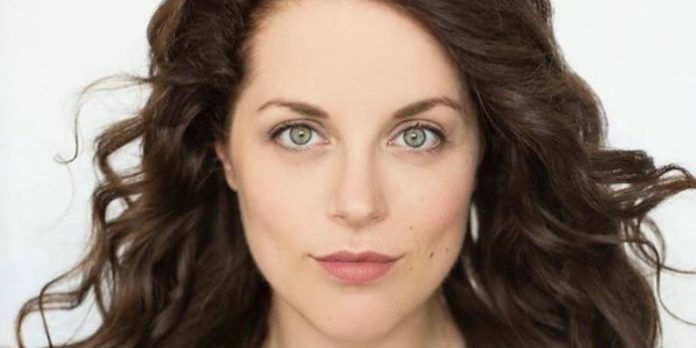 Not only did she find herself performing in other shows around the region, including a second run at Les Mis in 2015, she went onto both the Shaw and Stratford Festivals. It would be her role in the Stratford production of Jesus Christ Superstar which would eventually bring her on Broadway in that show’s 2012 revival. Harwood now finds herself on the road with the North America tour of Beautiful: The Carole King Musical, which will land her back in Vancouver at the Queen Elizabeth Theatre this month. In the first part of our two part interview, we chronicle Harwood’s rising star from Vancouver to Broadway. Harwood’s career actually began long before she stepped into the role of Cossette for the Arts Club. It would be her love of dancing that got her started in the performing arts. While saying it was an inevitability she would eventually pursue a career in the performing arts, her dream initially centered on dance. After graduating from high school, Harwood fully expected to go on to study as a dancer and land a gig with a dance company. “I got into some dance schools when I went to an international dance competition where they were auditioning for different dance programs, but I ended up not taking any of those offers or scholarships because, honestly, as an international student I couldn’t afford it,” she explains. With a plan to stay at home and save enough money to commit to her studies, Harwood found herself at Trinity Western University, while working a part-time job. A huge musical theatre fan, Harwood took the leap and found herself getting the lead in an amateur production of Cinderella at Burnaby’s Footlight Theatre. “I think it was a huge risk on their part, but they saw something in me, and from that point on I have had a fire lit under me,” she says. Harwood never looked back from that moment, quitting her part-time job and pursuing her dream by auditioning and performing in anything that came her way. Harwood would eventually find herself back at Trinity Western University, as part of its theatre program. “I had a lot of comfort on stage from being a dancer, and I was getting stronger in my singing, but I knew that I needed some training,” she says. 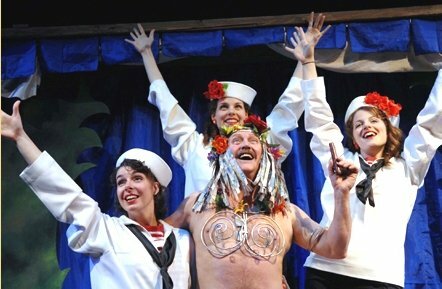 Kaylee Harwood (far right) in the Chemainus Theatre Festival production of South Pacific. Photo by George F. Blumel. Harwood credits Trinity Western in giving her a solid base for her career. It is here where she would build sets, learn how to direct, study Shakespeare, and perform each semester in a different show. It would be in the last summer before her final semester when Harwood found herself working in a production of South Pacific at the Chemainus Theatre Festival on Vancouver Island. It is here where she was called upon to use her ability to multitask. Becoming singularly focused on her burgeoning career on stage, Harwood was all in. Quickly making a name for herself on local stages, Harwood would go onto receive two Jessie Richardson Theatre Awards, including awards for most promising newcomer, and for her ensemble work in the Carousel Theatre production of A Year With Frog and Toad. 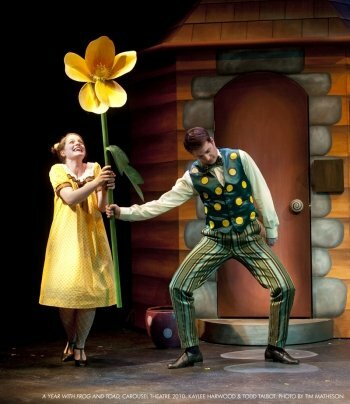 Kaylee Harwood (left) and Todd Talbot in the Carousel Theatre production of A Year with Frog and Toad in 2010. Carousel Theatre photo by Tim Matheson. Having worked with Harwood on three productions at Carousel, artistic director Carole Higgins remembers she was destined for a career far bigger than Vancouver could provide. 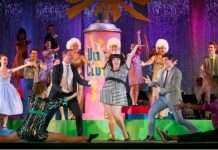 Harwood would even catch the eye of longtime Vancouver theatre critic Colin Thomas in his review of her 2014 performance in Rodgers and Hammerstein: Out of a Dream. In an email, Thomas recalls Harwood as having the necessary combination of confidence and humility. Calling it a logical leap, Harwood eventually moved herself across the country to find work, with stops at Edmonton’s Citadel Theatre among others, before making the connections which brought her to Stratford and into productions of Camelot and Jesus Christ Superstar. “I count Stratford as a turning point in my career, where things started to really deepen and move along quite rapidly,” she says. It would be the Stratford Festival production of Jesus Christ Superstar, that would take Harwood to Broadway a year later. Eventually getting her Green Card, Harwood then began to audition for other Broadway shows. It would take three auditions and a number of self-tapes of her performing the material before successfully landing in the touring production of Beautiful: The Carole King Musical. Next week: part two of our interview with Kaylee Harwood: from Broadway to Beautiful and home again.